(CBS News) The American auto market has been tragically Alfa Romeo free for years. But that's all about to change when the upcoming 4C sees production later this year. In an industry often marred by production delays, it is exciting to announce that the Italian automaker's newest model will actually be coming out ahead of schedule. The carbon fiber 4C was originally going to be unveiled at the 2014 Detroit Auto Show, but sources have told British car blog Autocar that the Italian speedster will be revealed in production form this summer. A concept of the 4C, seen above, was shown at the Geneva Motor Show in 2011. 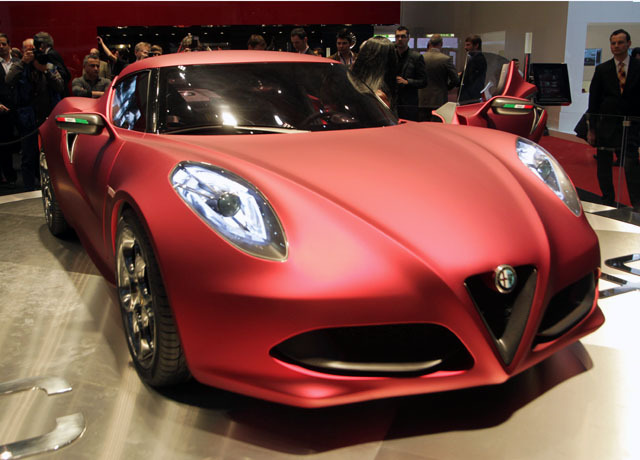 According to reports, Alfa Romeo hopes that the 4C's turbocharged 1750cc engine could come in other Fiat Group models. The engine may find itself, in a more economical form, in Dodge, Chrysler and even Jeep models. It seems likely that not only will the 4C be for sale in the United States, it may be built here as well. Alfa Romeo's boast of having two new "global production sites" - hinting that America's first taste of Alfa Romeo horsepower may be built in the U.S.A. as well.